Martina Schmitz (German) and her husband Markus have a passion for traveling to interesting and very remote places in Asia, Africa and the South Pacific. This year, Syria was on top of their list thanks to a trip that Martina’s aunt had made to the country last year. Martina is a trained art historian and an archaeologist with an equally keen passion for music and art. Markus is a swiss lawyer based in Zürich. I have had the pleasure of knowing both in the Mid 1980’s when attending graduate school in New York. Having just returned from close to three week stay in Syria, I had urged both Martina and Markus to share with me their perspective and impressions of their trip. Set below is their report which I had decided to share with Syriacomment readers. The tourism potential of Syria is immense. 5 sites on the UNESCO list and more than 15 lined up for it. Diverse landscapes from the dark stones of Bosra to the Fertile Crescent near Apamea to the deserts of Palmyra and mountains of the Dead Cities, it is all there. You can hear Aramaic, the language spoken at the times of Jesus; you can take a look at one of the first alphabets of mankind from Ugarit. Ancient monuments (I mean, really ancient, not just Roman) take turns with Islamic monuments, Christian monasteries and churches of all denominations, beautiful mosques and shrines, biblical places like St. Paul’s hiding place, castles of the crusaders, beautiful old merchant houses. You also find great souvenirs in the souks, authentic local products like soap from Aleppo or Zatta spices or the ubiquitous Sheeshas, all not made in China! 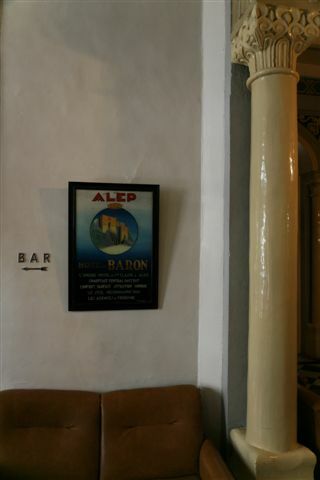 And visit the legendary Baron Hotel in Aleppo which once accommodated Agatha Christie and T.E. Lawrence. Conclusion: This country has the stuff tourism longs for! Just don’t look for a decent foreign language bookshop or access to Facebook. And of course, no Coke ads or McDonalds yet. Thank God, you won’t find hardly any advertisement except Syria Tel. You are travelling in a fairyland and in a one-party one-family state. You feel totally safe, you travel without any stress, and hardly anyone bothers you. Although there are tourists in Syria, they are still few and far between. After 9/11 and the Iraq war, the tourism industry is trying hard to recover. European tourists in Syria still amount to only 1 million visitors annually1. Compare to Venice on a spring weekend: 150.000 tourists (this is true), or annually 20 million in 2007. In Syria, you are in another world. We started out in Damascus (3 nights), visited Bosra from there, then went to the mountains to see the monasteries of Thekla and Sergius & Bacchus (1 night), briefly visited Tartus and continued to Hama (1 night), with stops at Krak des Chevaliers and Saladin’s castle, then Aleppo (3 nights), visited St. Simeon monastery from there, then ventured to the East with a brief stop at Assad Dam (1 night in Deir ez Zor), visited Rasafa in the desert and Dura Europos on the banks of the Euphrates and continued to Palmyra (2 nights) before terminating our trip in Damascus (1 night). Being the first stop on our trip, the ancient city of Damascus was of course an overwhelming experience. The old town is absolutely stunning and has a high tourist potential. It is breathtaking to walk these historic alleys. The things to see are numerous and very heterogeneous. But just flowing through the old town with the stream of people is an adventure in itself. There are things to see from all layers of history: The Street called Straight right out of the bible, Umayyad mosque, Roman city wall, Ottoman mosques and caravansaries, old Damascene Palaces like Dadah or Azem, Khans like Al Jumruk and the Souk Al-Hamidiyya, the Bimaristan Nuri Hospital from the heydays of Arabic culture, the amazing National Museum and the Hejaz train station, you can just keep on naming sights – and we did not even start to venture out of the old city like into Al Midan or Salihiya. At the moment, you can see and feel that tourism is slowly restarting after the complete breakdown of 9/11. You see small groups of European (Italian, German, Swiss, French, Scandinavians) culture tourists and also some Americans strolling through the old city. There are some really nice boutique hotels around and more are opening. The Talisman 1 and 2 of Damascus will soon be joined by a Talisman 3 Hotel in Aleppo. Talisman 1 was very beautiful (highly recommended by us for any traveller to Damascus). The restaurants in the old town are numerous and of good quality. We’ve had some of the best Mezze here, in great places like Narcissus Restaurant, Beit Jabri or Cham House Restaurant. The city has this 1001 nights feeling for the European tourist – and you can certainly sense where Venice got the inspiration from! People are distant, but very friendly. There is practically no hassle if you don’t want it. It is not like in Morocco or Egypt. If you seem interested in buying, the merchant starts haggling, but if not, he leaves you alone. No one runs after you with carpets or whatever, like in Morocco. We saw very few beggars. We saw women of all kinds, fully veiled and very modern. People looked at us, recognized our tourist status but left us in piece. With some shop owners, those who spoke English or French, we talked a bit. If you speak one or two phrases in Arabic, you receive a smile. With J., our excellent guide, we had serious and lengthy discussions. He was recommended to us by my aunt, she employed him as a guide last year. He was educated in Germany (East Germany in the early 80s), is very knowledgeable about history, but was also quite willing to talk about politics and religion. We talked A LOT about Middle Eastern Politics. Of course he would not lash out at the government but he was open and critical of certain aspects. So our experience in Syria was not at all only ancient, but we covered a lot of recent grounds as well. A very special experience was the visit to the Shiite memorial for Mohammed’s granddaughter Zeynep outside of Damascus, on our way to Bosra. We decided for a quick stop and this turned into a truly memorable experience. To see the Shiite women in their religiosity, sadness and ecstasy was a very impressive moment for my daughter and me. We had been to mosques and of course to the Umayyad Mosque in Damascus, but never to a Shiite sanctuary. This visit left a lasting impression on us. After travelling through western Syria for a week, we arrived in Aleppo. We were instantly fascinated by this ancient city. 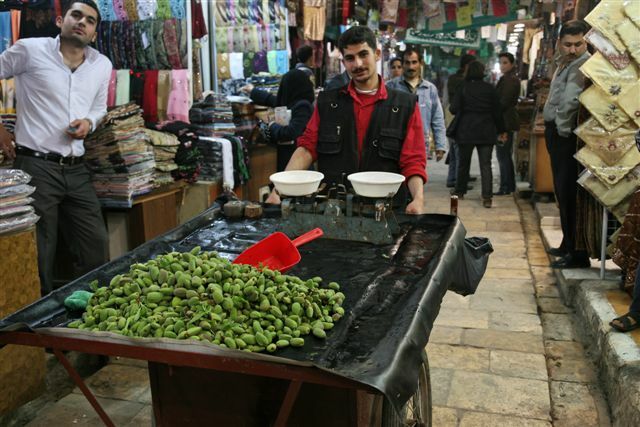 Like Damascus, this city offers so much to the tourist, it is simply ideal for a city trip. Our hotel was the Beit Wakil in the old town, a classic boutique hotel with a lot of taste and very austere rooms (great atmosphere – we loved the old radios). We immediately ventured into the souks we had heard so much about. It was a true oriental experience. If it smells good, you are in the soap souk. If it smells strong, you are where the spices are sold. Suddenly you enter the souk where fabrics are sold. Or artificial flowers. Or a Khan full of shoes. An alley full of slaughtered sheep. After a while, you are near the big mosque. You find pistachios and sweets. Have a tea. The mosque, as in Damascus, is – contrary to western belief – a much more casual place than a Christian church. If you play by the rules, cover up and take off your shoes. My daughter and I sat inside with the women for quite some time. Women chat (with somber voices) kids play (quite wild running). Once you feel accustomed to the environment, it can even be a pleasant experience. We blended in, we didn’t disturb, we enjoyed. We pass churches of so many denominations I cannot recall. By chance, we enter the Maronite Cathedral of Aleppo in Al Jdeida. We sit in the back and listen to the priests perform an ancient ritual. Fascinated by the sound of the singing. So different, so peregrine, so sincere. We loved it. Back in the souks. It’s easy to get lost or to loose parts of your family. Don’t worry, you find them again. Have a nut. Smell perfume. Feel the silk. Look. Glance into eyes of women in veils passing by. Smile at kids. Come back next day. Another day and a trip to St. Simeon. Early enough have the place almost to us. Then come the schoolchildren. They are all very eager to try the few words they know in English. Hello, how are you? 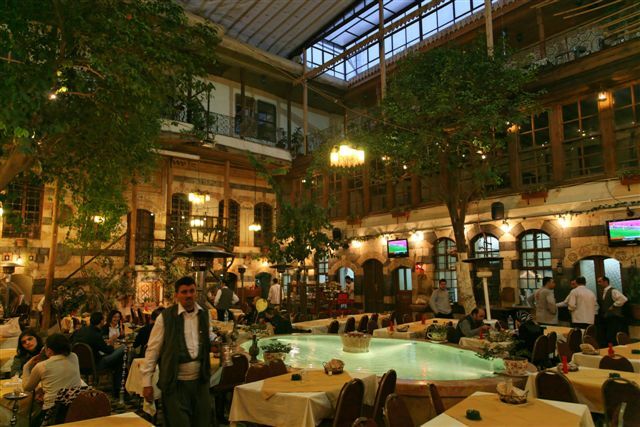 Back to Aleppo, a visit to the Baron Hotel. We have read so much about this venerable hotel, of course we want to see it and have a drink there. We like it so much that we stay for lunch (which was excellent). It is an old hotel in dire need of a renovation – but it is a museum! Let it stay just like it is. You can just feel Agatha Christie and T.E. Lawrence sitting in the dining room. Friday afternoon: the souks are empty, only a few shops are open. Some alleys are dark or closed altogether. A magic experience. You can hear distant sounds of the city, steps in the dark, some generators running. Was James Bond ever filmed here, or Jason Bourne? Great scenery, movie material. Delicious food. One of the best restaurants was Beit Sissi (yes, named after Elisabeth of Austria) or also Khan Zeman. Mouthwatering. Farewell from Aleppo. The souks are awake again. Flowing with the stream once more to one of the old Khans to take a look. A little man waves us up a staircase. Suddenly we are in another world, on top of the souks. A bizarre landscape with the towering citadel, the vaulted domes of the souk and hundreds of satellite dishes. In the distance, the new city, as far as one can see. Sounds reach us from below, and steam, and laughter. We can look down into the souks and watch and listen and smell. A magic farewell. I fell in love with Syria 100 years ago when I studied the archaeological sites. I many ways, finally going there for the first time was like a déjà vu. I wish, though, I had seen it before someone (?) ruined especially the rural architecture with concrete. In fact, I will sign up with anyone who launches a concrete hate group on Facebook. All over the country we saw unfinished concrete buildings, even whole villages or quarters (like Palmyra). I felt like Asterix in “The mansions of the Gods”. Look that one up. That’s how large parts of Syria look like. And nowhere on our trip, as hard as we looked, did we see people working on these unfinished buildings except one (1) worker who was plastering a concrete wall. We are serious. We saw many people working but not on these ghost towns or ghost quarters. It seemed to us as if recently there must have been an incredible building boom that somehow got stuck. We asked our guide, we asked our driver, we asked other people we met. No one could give us an explanation why these building projects were not continued or finished. It remains a mystery to us. Sadly, a lot of the charm of the villages in the country has been lost due to this building frenzy. I joined the I Hate Plastic Bags group on Facebook before the trip but now I have all the more reason for it. I have seen other countries where there is no concept of recycling or collecting plastic bags, where poor people use them as food containers for their daily rice or soup. One country where these bags just lie around after use was Vietnam. But Syria was a lot worse. In fact, of the many villages we drove through, not a single one was without a serious littering problem. The bags were everywhere, myriads of them. It is not just an aesthetic problem. These bags don’t rot for a long time, and sheep die after swallowing them. There seemed to be no serious trash problem in the cities. We even saw see garbage collectors. And little trash in the alleys. The cities were clean compared to how the countryside looked; especially the inner cities with the historic sites were being taken care of. But the countryside looked pathetic. Unfinished concrete houses, plastic bags, concrete, plastic bags, concrete, plastic bags. The few communal sites, like the roundabout we saw on the way to Dura with a fountain and the usual Assad father and sons portraits, looked like leftovers from the Soviet Era. It had this desolate look and seemed unused for decades. And of course full of plastic bags. I can imagine that a concept like communal effort (everybody get together and pick those bags up) does not apply to Syria but it does apply to the communist or socialist countries I knew here in Europe. Therefore, I don’t understand why Syria, being a tightly run one-party one-family country, can’t solve this problem. Everybody get up and pick up the trash. Invent a national trash-pick up-day. What’s the problem? Am I too romantic? I have never seen more beautiful archaeological sites and excavations as in Syria. I was in awe over Bosra, Apamea, Rasafa, Dura and Palmyra. I have never seen more picturesque settings. The Dead Cities in the stunning landscapes of the Belos Mountains, the beautiful mosaics of Philippopolis, the perfect Roman theatre of Bosra, the aesthetic colonnades of Apamea, the staggering crusaders castle Krak des Chevaliers, the mystic desert city of Rasafa and the one-of-a-kind view over the Euphrates from Dura. But of course I have not seen all there is. There are tons of other sights to see (Zenobia, Mari, Ebla, Zenobia, Qualaat al Rahba, Qasr al-Heir ash-Sharqi, just to name a few). But what I saw was incredible. And we certainly have never seen more beautiful ruins all for ourselves. These ruins were waiting only for us four to visit them! No sweaty tourists, no hordes of souvenir sellers, no bad restaurants at the exit gates. No buses, no loud tour groups with little flags waving, no parades of German, Swiss or Italian culture tourists. No Americans. OK, there are some other tourists but there are so few you can easily avoid them. If there is a group ahead of you, slow down, have a Nana somewhere. They will leave soon, and the site will be quiet again and all yours. 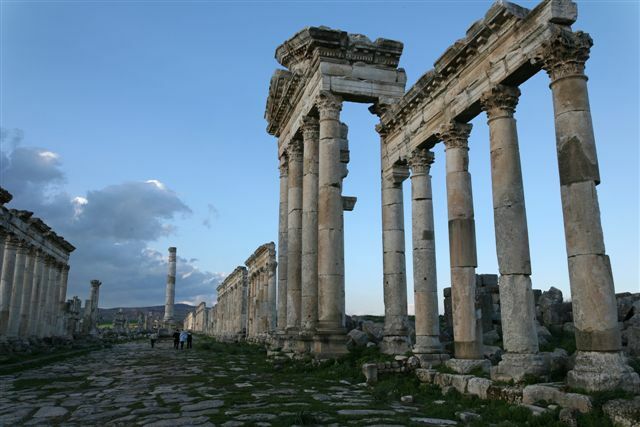 The only place with a veritable tourism industry outside of Damascus and Aleppo is Palmyra. A little in Bosra, less at the Krak and Saladin fortresses, hardly anything in the Dead Cities. In other excavations like Dura, Apamea, Rasafa, Zenobia, chances are you will be on your own. But even in Palmyra you can have large parts of the excavations for yourself. Go for sunrise, before the buses come, or in the afternoon when they have left. Go for sunset, when the architectural reliefs come to life in the golden sun. Go at night when the site is lit. Take it in slowly, and meander into the ancient city. So I found my personal ruins. Forget Rome, Pompeii, Athens or Delphi. Syria is much better. OK, I have not been to Egypt but I hear it’s crowded. I have not been to Iran but I have to wear a veil there. I have been to the Taj Mahal and had to get up at 4 am to get a halfway undisturbed view of the monument. It’s spoiled by tour groups after 5 am! In Pompeii, one load after the other poured in from the cruise ships. They touched the murals and even tried to scratch off paint. A fairground, a carnival. They yelled and smelled. In Syria, everything was different. I remember Dura Europos – one highlight of our trip, an intriguing site to visit Syria’s east. The Hellenistic/Roman fortress city lies high overlooking the Euphrates: a magic view into Mesopotamia and a feeling of timelessness. The gate keeper, us four and a few archaeologists digging on the northern edge of the citadel. Except of what is in the Damascus National Museum, most of the town is still unearthed, thank God, and let’s leave it this way. What’s been underground for so long is safe for a few more years – and safe from tourist gawkers or Bedouin diggers. And I remember how Rasafa appeared at the horizon of the desert, magically, windy, sandy. The little ticket booth, freshly painted, the gate keeper and us. The wind was so strong, we had to cover our faces Bedouin style. Lawrence of Arabia. Striking Rasafa, an ancient, long-abandoned city, once was a giant worshipping place for over 100.000 people, with a now ruined basilica for one of the stars among the early Byzantine martyrs, Roman soldier Sergius. For over a thousand years, Rasafa was a stopover for caravans to the orient. A bustling market town with Souks, filled with pilgrims and merchants who met in the middle of the desert. What remains today is a giant ruined city of sand colored stones rising out of the featureless desert – and the stories in our heads. And it’s worth it. Those concrete buildings everywhere, I have seen them myself. The biggest one is that box shaped building in the middle of Damascus, I think its a mosque. I think people build until they run out of money, and when the projects gets more, they continue, if not, it just stands there. Most of those concrete unfinished projects are private owned and private constructed, so people build and continue their apartments/houses/commercials/farms in many phases/generations according to how much money they have at the time until the building is finish and the Syrian municipalities know very well the financial situation of the majority of Syrians so they don’t force the law which state that every building should be done under certain time frame. An average building takes couple generation to be fully finished, and this is the mystery of seeing lots and lots of those concrete unfinished buildings. The problem get worst in the unplanned and the outlaw built neighborhoods where everything is built as fast as possible (sometimes in less than 24hrs) since we have a law that doesn’t allow a demolition to take place on any occupied building even if it was built without a permits and proper licenses and only recently they are going to publish a bylaw dealing with such problem after those areas become on epidemic (more than 45% of the urban neighborhoods of Damascus are considered to be a well established urban ‘slums’). There are a couple of European companies specialized in Urban design that are doing research and studies on the urban development in Syria and they are pushing for new bylaws and guidelines with municipalities in and around Damascus and Aleppo, it will take some time before we can see any changes though. This is very true, I know several family members who are building in Syria and it takes them several stages to finish their projects, usually at least 10 years. Unfortunately, it does affect the aesthetic appearance of the country, but at the same time if the government forces all those people to finish within a certain timeframe most of them will not build because they won’t have the financial resources to fund such project in such a short period. Our cities are in desperate need of urban development, however, as many areas were chaotically and illegally built, causing many problems for the city and the country. Of course this all goes back to the economic status of the country as a whole, which forces poor people to have to build this way if they are to afford any housing. This is why the government has looked the other way in this issue for so long. In Syria ,the buildings constructed since the 60’s are ugly ,cheap and badly finished. 1. the absence of mortgages that would allow Syrians to finish a building is a main cause for the partly-built-look. 3. Another reason is the tax system. An unfinished house escapes certain taxes. 4. Many investors add apartments when they believe they can afford to sell them. The rapid increase in the price of primary building materials has caused many investors not to continue adding apartments or floors. But they wait for people to have liquid cash. 5. A fifth reason. Ugly is socially acceptable. My father-in-law built a village house with cement pillars and re-bar sticking up from the roof in the glorious, partly-built style that is repeated throughout the village for all the reasons listed above. He does not plan to build another floor any longer. Perhaps he did years ago but it has been clear for years that his kids will never spend much time in the village and he will not need another floor. But because it is normal to leave buildings like this, he has just left it unfinished rather than spend the money to add “qaramiid” or the terracotta tiles that would make it beautiful. In short, it is socially acceptable to leave the roof raw, so why spend the money to finish it beautifully. This is a major reason for the persistence of the ugly look throughout Syria. It is expensive to finish roofs and acceptable not to. The same thing applies to painting cement structures. Thank you for the explanations. Illegal buildings become de facto legal when you put the walls up before the authorities take them down. Once you have passed that stage, you are guaranteed that the building can be occupied and used down the line even though it is technically illegal. Putting up the wallls becomes everyone’s primary target regardless of whether people have the money to actually finish the projects. Presumably, their kids can finisg the job at some stage. As to the garbage and plastic bags littering the countryside, I wish there was an explanation that we can all swallow. Do you think that not having good contract laws that permit Building owners who rent to others to be able to get their property back or increase rent , because of rent control,I Think if they have these laws people people will build and finish building to rent which can improve housing availability. The rent contract laws are in place. You can do so today very easily. As many know by now, Carrefour supermarket opened its first store in Syria in the outskirts of Aleppo. The opening has been a major hit. The store’s general manager held a press conference and announced that the group will follow a strtaegy of low pricing and forgoing profits in the first year to attract customers. The strategy seems to have paid off. Aleppo residents seem to flock to the store in high numbers and are mesmerized by the huge product offerings, large space and reasonable prices. I think that this succesful launch is a tatse of things to come. In Greece I wondered why so many houses looked unfinished with concrete pillars with irons sticking out of roof. To me was explained that it is common and done to avoid taxes. When I rented during the past decades a car and sometimes a motorcycle on several Greek islands I used to travel deep in the country side. The country side had asthonishing many illegal “private” dumping places. People seem to drive their cars to isolated places an dump their waste without thinking much about the environmental and esthetical problems. Things there have developed in better direction, but slowly. All Mediterranean countries even the richest EU members seem to have problems with public environmental awareness and with fair priced functioning public waste collection systems which I suppose is the main reason. Israelis seem like also to “donate” the waste to neighbours joy. They used to dump their towns’ and settlements’ waste to for example Deir Sharaf near Nablus, Palestinian area. There are also several other “projects” on occupied land. I heard from a friend that the government is inded studying different ways of dealing with the unfinished cement buildings problem in the countryside. Providing financial assistance and incentives, is one of the most obvious answers for now. He now believes that change in Syria will not come from any one in the outside, not from opposition members working in hotels, cafes, and internet sites. He also stated that there are red lines that any opposition member should not cross, like being backed by countries which have goals that are not consistent with Syria’s interests. اعتبر مراقبون سوريون إن” استقالة مدير مكتب جبهة الخلاص السورية المعارضة في واشنطن دق مسمارا جديدا في نعش المعارضة خارج سوريا ، كما خلافات حزب الاتحاد الاشتراكي وإعلان دمشق التي أثرت بشكل سلبي على المعارضة في الداخل “. وأكد الكاتب والمحلل السياسي السوري لؤي حسين في تصريح خاص لإيلاف” برأيي انه منذ فترة طويلة المعارضة السورية بحكم المنتهية نتيجة أنها لم تلعب دور المعارض، ولكن كان هناك جماعات سياسية وتنظيمات صغيرة احتلت مكان المعارضة دون أن تلعب الدور المناط بها كمعارضة ، وبالتالي كان المآل الطبيعي لهذه التجمعات أن تتفسخ وتتفكك” . وشدد حسين “إن المعارضة السورية بشكل عام لم تلعب دور المعارضة ، وبالتالي لم يكن لديها حافز وأدوات المعارضة لذلك كانت لابد أن تتصادم على أمور صغيرة داخلية “. وأشار الى “انه طالما ان المعارضة لم تستطع ان تتحمل مسؤوليتها كمعارضة تجاه المجتمع السوري بالتالي كان اشتغالها دوما في الحقل الأمني وليس في الحقل السياسي بمعنى ان كل نشاطاتها تقيسها على رد الفعل الامني للسلطة وليس على الجدوى السياسية التي يمكن ان تعود على البلد والمثال على ذلك عدم اقدام اغلب جهات المعارضة على المشاركة في انتخابات مجالس الإدارة المحلية “. من جانبه قال الدكتور عمار قربي رئيس المنظمة الوطنية لحقوق الإنسان في سوريا في تصريح خاص لايلاف” أصلا لم يكن هناك معارضة منظمة قبل جبهة الخلاص وقبل اعلان دمشق بل كان هناك اشخاص معارضين داخل وخارج سوريا ” ، وأضاف” المعارضة المنظمة انتهت اثر صدور القانون 49 الذي حظر عمل الإخوان المسلمين في الداخل واثر اعتقال المئات من كوارد حزب العمل الشيوعي والمكتب السياسي أما تسميات أحزاب المعارضة داخل سوريا فلا تختلف عن تسميات أحزاب الجبهة فهي أسماء فقط دون كوادر ودون أعداد ودون نشاط ودون جذور ” ، واعتبر” انه سيبقى هناك أشخاص معارضين ومعارضين مستقلين وهم أكبر من الأحزاب وأكبر من الايديولوجيا هذا ناهيك عن وجود المعارضة الصامتة “. وكان بشار السبيعي أعلن استقالته من منصب مدير مكتب جبهة الخلاص السورية المعارضة في واشنطن وانسحابه من عضوية المجلس الوطني فيها ، واعتبر السبيعي في بيان “إن التغيير والإصلاح السياسي في سورية لن يأتي على أيد خارجية أو أحزاب وجماعات معارضة تعمل في مقاهي وفنادق عواصم غربية وإقليمية وعبر مواقع إخبارية الكترونية”. وأضاف “أن أي تعامل مع أي جهة أجنبية قد تكون هي نفسها لها مآرب وأطماع استعمارية وانتهازية في سورية هو خط أحمر لكل وطني سوري شريف، وأن مثل هذا العمل نهايته نتيجة واحدة فقط تأتي بالدمار والخراب على كل سوري”. وكانت جماعة جماعة الاخوان المسلمين في سورية اعلنت انسحابها من جبهة الخلاص التي شاركت نائب الرئيس السوري السابق المنشق عبد الحليم خدام في تأسيسها مع شخصيات وحركات معارضة سورية العام 2006، وقالت إنها اتخذت هذه الخطوة “بعدما انفرط عقد الجبهة عملياً وأصبحت عاجزة عن النهوض بمتطلبات المشروع الوطني والوفاء بمستلزماته” ، كما أعلن صلاح بدر الدين ومحمد رشيد انسحابهما من جبهة الخلاص كممثلين للمكون الكردي . I think many commentators here owe themselves a pat on the back for helping “Bashman” see the light! I liked the bit about “the uselessness of opposing on electronic websites”. Does this mean that we will not have the pleasure of reading Mr. Bashman’s online comments any more? Some do hope so. Maybe he can learn a thing or two from his well-respected father. On the initiatives to change the ubiquitous “under-construction” look of the Syrian countryside, an initiative of “rural beatification” that makes “qarmiid” (terracotta tiles) available for heavily subsidized prices can do wonders all around the country. Many will still not want to loose the “stoo7” space for economic reasons, but many will love to have a nice looking house instead of the “socially acceptable” under-construction facade. Theoretically, knowing how family and village rivalries in the country side goes, it takes one building in the neighborhood to look nice for the whole neighborhood to follow.. and then the village.. and then it’ll spread like fire across neighboring villages! He either MB member and following the lead of the MB or you had significant effect on him and changed his mind. I wish I can publish my emails from the past few years to Bashmann and to Ammar and others. But I don’t think I had an effect on them. They are all smart people, but they felt there was “a window of opportunity” during the Bush administration to change things to their liking. Now they realize the window is closed, and this is why there are changes in their camp. Idaf, You slay me! I have been laughing all morning. Keeping-up-with-the-Muhammads is definitely a powerful incentive in Syria, as it is everywhere. When I was in the village in 2007, I mentioned to Abu Firas how beautiful his brother’s house was. His brother’s children have made good money with a construction outfit they started, making him more financially successful than my father-in-law, who used to be “the man” in the village. Abu Firas decided his house should be painted and Manar and I chipped in. Now that my parents in law are retired, their combined retirement income (Abu Firas was a Liwa and Um Firas was a high school teacher for 25 years, including the rent earned on two small apartments in Latakia rented to students, is a little less than $900 a month. Painting their village house inside and out cost $2,000 for material and labor. In conclusion, you are right about the social pressure of keeping up with the Muhammads. It is powerful. It certainly worked on me!! But there is a limit to its powers because incomes are low and expenses high. As for Bashman, I think we are being too hard. I admire his effort to do “something.” Syria does not make it easy to promote change from the inside, to say the least. It is a problem for everyone. I always appreciated my debates with Bashman, who is smart, articulate, and a gentleman. About time..Syria established a ministry of Environment..
DAMASCUS (AFP) — Syrian President Bashar al-Assad reshuffled the government on Thursday, appointing six new ministers and creating a separate environment ministry headed by a woman, the official SANA news agency reported. The shake-up was the sixth since the government of Prime Minister Mohammed Naji Otri was formed in 2003 and the latest since September 2008. 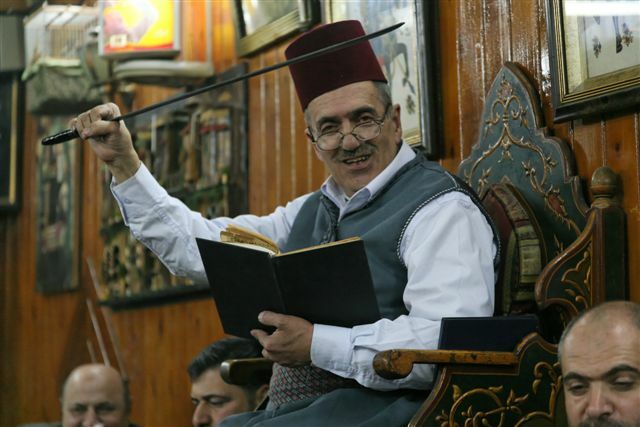 A decree by Assad saw senior intelligence officer Saeed Sammur named as interior minister, replacing General Bassam Abdel Majid, a former military police chief who entered the government in a February 2006 reshuffle. The justice ministry also changed hands, with Ahmad Yunis, a judge and former MP, replacing Mohammed Ghafri. Presidential Affairs Minister Ghassan Laham left the cabinet and was replaced by Mansur Azzam, who used to be secretary general for presidential affairs. Ophthalmologist Rida Saeed takes over as health minister from Maher Hussami. The former ministry of local administration and the environment headed by Hilal al-Atrash was split in two, with the local administration portfolio going to Tamer al-Hijeh, a former governor of the northern city of Aleppo. A woman, Kawkab al-Sabah Dayeh, was appointed Syria’s new minister of state for the environment. Previously she headed the office of environmental and health issues at the Syrian Women’s Federation.